Background: The high morbidity and mortality associated with malaria especially in sub-Saharan Africa such as Nigeria calls for prompt preventive and curative measures including adherence to standard treatment guideline. Aim: To assess the level of adherence with the five defined WHO prescribing key indicators. Methods: This was a retrospective evaluation of the performance of antimalarial drugs prescribing practice among clinicians from January to December 2014. It was done through a set of drug prescribing indicators developed by WHO and the International Network of Rational Use of Drugs (INRUD). Results: Of the 385 patients prescription randomly generated from the record of 12,477 patients in this descriptive study, a total of 143 (37.1%) had antimalarial prescription(s) with no gender variation. The evaluation of the studied antimalarial drug prescriptions through defined WHO prescribing indicators revealed an average number of drugs per encounter of 3.9, with 37.4% of the prescriptions written in generic names. All the antimalarial drugs were prescribed from the National Drug Formulary, with injectable form constituting 4.7%. Conclusion: This study shows suboptimal compliance with WHO prescribing indicators with respect to average number of antimalarial per encounter and prescription in generic names. The proportion of antimalarials prescription in injectable form falls within the WHO acceptable limit of ≤10%. All antimalarial drug prescriptions in this study were from essential drug list. We, therefore, recommend rational antimalarial drug prescription in conformity with WHO/INRUD core drug prescribing indicators. Rational use of drugs against most common and life-threatening tropical diseases such as malaria remains a huge challenge, particularly in sub-Saharan African region. The region carries a disproportionately high share of the global malaria burden. Sub-Saharan Africa contributes an estimated 90% of global episodes of clinical malaria and 90% of global malaria mortality., Resistance to both insecticide-treated net and common antimalarial agents in addition to other factors such as increased production and consumption of substandard and fake drugs, financial and budgetary constraints by some heads of government, market inefficiency, distortions, behaviour of health systems and lack of effective vaccines are responsible for persisting threat pose by malaria.,,, Multidrug-resistant Plasmodium falciparum malaria continues to spread throughout the world. The outcome of the 2002–2004 drug efficacy research conducted in the six geopolitical zones in Nigeria showed a high level of resistance to antimalarial drugs especially chloroquine that ranged from 5.8% to 96.3%. This report led to change in national antimalarial treatment policy in the year 2005 by the adoption of artemisinin-based combination as a first line medication against malaria. It was based on the WHO recommendation that an antimalarial agent may not be used as the first line when the level of resistance is above 25% in an area. Unfortunately, several studies on malaria have reported inappropriate prescribing practices in both public and private health care facilities due to lack of adherence of prescribers with the standard treatment guidelines (STGs).,,,, To optimise the availability and appropriate use of drugs for patients, a well-designed, comprehensive national drug policy is necessary. The WHO and the International Network of Rational Use of Drugs (INRUD) have developed a set of drug prescribing indicators to be used as measures of prescribing performance in health-care setting. Although the chemotherapy for malaria adopted based on a recommendation from WHO/INRUD has been adjudged successful by some authorities in Nigeria, to the best of our knowledge, adherence of antimalarial drugs usage according to WHO prescribing indicators have not been reported in Northeastern Nigeria. We therefore retrospectively reviewed the antimalarial drug prescription over 1 year period to assess the level of adherence with the five defined WHO prescribing key indicators. Retrospective study was carried out in National Health Insurance Scheme Pharmacy Unit, University of Maiduguri Teaching Hospital. Maiduguri, the capital of Borno State, is among the largest cities in Northeastern Nigeria with an estimated population of 728,539. It lies on latitude 115°N and longitude 135°E and occupies an area of 50,778 km 2. The climate of Maiduguri is favourable, with a mean annual temperature of 34.8°C. Maiduguri is a cosmopolitan town which is inhabited by various ethnic groups, but the most dominant ethnic group is Kanuri (www.bornostategov.ng). The study period was January 2014–December 2014. Where n = sample size, z = standard normal deviate at 95% confidence interval (CI) which is 1.96 z = 1.96p = proportion of the study population expressing certain characteristics is 50% which is the same thing with 0.5.p =0.5 d = degree of freedom or significant level is 0.05, d = 0.05, n = 385. This is simple random sampling. Prescriptions collected from January to December were numbered from 1 to 12,477. These numbers generated was entered into SPSS and randomly selected 385 numbers out of the 12,477. The 385 numbers selected were then sorted out from the 12,477 prescriptions and were subjected to analysis using SPSS Inc. SPSS statistics for windows, version 16.0 (Chicago IL, USA); SPSS Inc. 2008. Percentage of drugs prescribed from the national essential drugs list (EDL) or the facility's formulary. Optimal level: 100%. After data were entered and cleaned carefully, different prescribing indicators were computed using the following formula adopted from the WHO's manual for prescribing indicators assessment. Percentage of drugs prescribed from EDL = (number of drugs prescribed from EDL/total number of prescribed drugs) × 100. Of the 385 patients prescription randomly generated from the record of 12,477 patients, the mean age of the females was higher than males, P = 0.001, 95% CI (2.93–4.99). There was no significant difference in the distribution of the studied participants based on gender, P = 0.06 (−0.31–20.71). A total of 143 (37.1%) out of 385 had antimalarial prescription(s) with female constituting 76 (53%); the proportion of female prescription containing antimalarials was not significantly higher than those for males, P = 0.56, 95% CI (−11.49–24.09). The mean ages of the participants, distribution based on gender and frequency of prescriptions with antimalarial medication is as shown in [Table 1]. Evaluation of the studied antimalarial drug prescriptions in comparison with the defined WHO prescribing indicators is as depicted in [Table 2]. It indicates that 37.4% were prescribed in generic names. All the antimalarial drugs were prescribed from the National Drug Formulary (NDF). The average number of antimalarial drugs prescribed per encounter was 1.0280, while the overall average number of drugs on prescription sheet per encounter was 3.3532. Prescriptions with antimalarial drugs showed a higher average number of drugs per encounter of 3.9371 than those without of 3.008, P = 0.001, 95% CI (2.87–4.79). 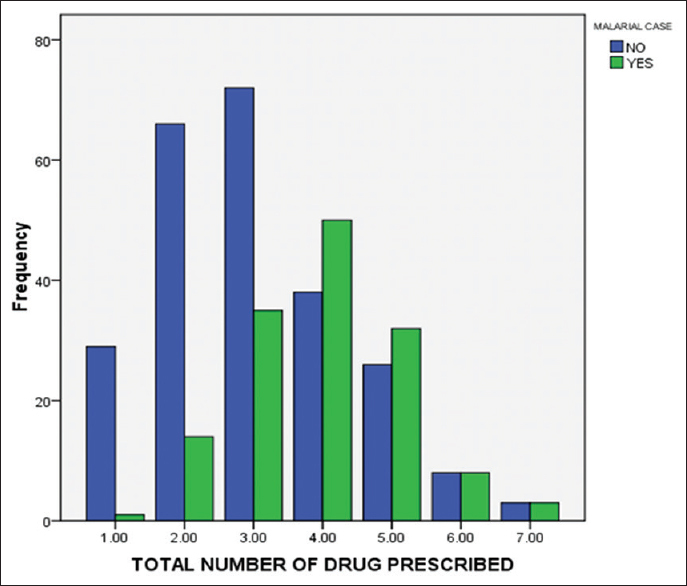 [Figure 1] shows the frequency of the number of drugs per prescription sheet stratified by malaria status. Prescriptions with antimalarial drugs had a higher number of drugs than those without antimalarial drugs. The morbidity and mortality attributable to malaria in sub-Saharan Africa is appalling. It is estimated that at least 90% of global death due to malaria occur in Africa. Several factors are responsible for the lingering threat of malaria in sub-Saharan Africa including Nigeria; inappropriate, ineffective and infrequent drug use due to irrational prescribing practices.,,, Other factors include lack of antimalarial drugs, absence or failure to adhere to STGs, dearth of laboratory facilities and trained scientists and poor budgetary funding., The WHO developed a core prescribing indicators to address the menace of irrational prescriptions and use of drugs that has for a long been known to feature in health-care facilities in developing countries. In this report, we evaluated the antimalarial drug usage in our facility through WHO core prescribing indicators. The average number of drugs prescribed per encounter of 3.9 obtained from this study imply polypharmacy, it was significantly higher than WHO recommended a limit of <2. Our finding is similar to previous report by Eze and Olowu from Nigeria of 3.9 and yet lower than 4.6 obtained by Irute John et al. With few exception, such as reports from Yemen  Ghana, Gaza, Kuwait  and Saudi Arabia  that reported average number of drugs per encounter ranging from 1.3 to 2.2, most studies from Mediterian region and sub-Saharan Africa that bears the most burden of Malaria reported higher average number of drugs per encounter.,,, Increased number of drugs per encounter which suggest polypharmacy, it is associated with several risks such as potential drug–drug interactions, fatal combined or synergistic medication side effect, adverse drug reaction, medication non-compliance, poor treatment outcome and wastage of resources. The WHO recommends all drug prescriptions to be issued in generic name, with an optimal value of 100%. Drug prescription written in generic names avoids confusion during dispensing and reduces the cost of purchasing branded drugs. It also enhances information exchange and communication between health-care providers. However, despite advantages of drug prescription in generic names and its promotion by WHO, several studies including the index study reported generic prescribing <50%.,,, Drug prescription in generic names of 37.4% in this study underscores the need to advocate drug prescription in generic names in our health institutions. Similar studies from Nigeria by Irute John et al. and Igboeli et al. reported 43.1% and 39.6%, respectively. However, similar studies conducted in Ghana, Ethopia, Saudi Arabia  reported higher rate of 60.5%, 79.2% and 61.2%, respectively. Comparatively, reports from Gaza strip  and Bahrain  reported lower antimalarial drug prescription of 5.5% and 14.3%, respectively. Several factors influence health-care providers prescribing behaviours: Level of education, training, peer group, workplace environment, drug supply system, advertising and drug detailing and promotion, control and regulatory measures, drug information and misinformation and patient demand. All antimalarial drug prescriptions evaluated in this report was from EDL issued by the WHO and adopted by NDF. The EDL/NDF provide a framework for rational drug prescription as drugs on the list are well-established drugs, already tested with proven efficacy and potency in clinical use and lower costs. The conformity of our antimalarial drug prescription with the national guideline adopted from WHO is not surprising because drugs in our facility are procured through Drug Purchase Committee with members drawn from relevant disciplines. Previous studies from other developing countries report higher than 80%.,, However, the WHO recommends that all drugs prescriptions should be from EDL/NDF. This study shows suboptimal compliance with WHO prescribing indicators with respect to average number of antimalarial per encounter and prescription in generic names. The proportion of antimalarials prescription in injectable form falls within the WHO acceptable limit of ≤10%. All antimalarial drug prescriptions in this study were from EDL. We therefore recommend rational antimalarial drug prescription to conform with WHO/INRUD core drug prescribing indicators. Breman JG, Alilio MS, Mills A. Conquering the intolerable burden of malaria: What's new, what's needed: A summary. Am J Trop Med Hyg 2004;71(2 Suppl):1-15. World Health Organization. World Malaria Report 2010. Geneva: World Health Organization, 2010. Available from: http://www.who.int/malaria/world_malaria_report_2010/en/index.html. [Last accessed on 2016 Dec 30]. World Health Organization. Guidelines for Treatment of Malaria. Geneva: WHO, 2010. Available from: http://www.whqlibdoc.who.int/publications/2010/9789241547925_eng, pdf. [Last accessed on 2016 Nov 17]. Ridley RG. Medical need, scientific opportunity and the drive for antimalarial drugs. Nature 2002;415:686-93. Chima RI, Goodman CA, Mills A. The economic impact of malaria in Africa: A critical review of the evidence. Health Policy 2003;63:17-36. Goodman CA, Coleman PG, Mills A. Economic Analysis of Malaria Control in sub-Saharan Africa. Geneva: World Health Organization, Global Forum for Health Research, 2000. Yeung S, Pongtavornpinyo W, Hastings IM, Mills AJ, White NJ. Antimalarial drug resistance, artemisinin-based combination therapy, and the contribution of modeling to elucidating policy choices. Am J Trop Med Hyg 2004;71(2 Suppl):179-86. Federal Ministry of Health. Nigerian national antimalarial treatment policy. Abuja, Nigeria: Federal Ministry of Health, 2005; 11. World Health Organization: Framework for Developing Implementation and Updating Antimalarial Treatment Policy in Africa: A Guide for Country Malaria Control Programme. Available from: http://www.afrolib.afro.who.int/documents/2003/english/framedrugp.pdf. [Last accessed on 2016 Sep 28]. Abuaku BK, Koram KA, Binka FN. Antimalarial prescribing practices: A challenge to malaria control in Ghana. Med Princ Pract 2005;14:332-7. Mannan AA, Malik EM, Ali KM. Antimalarial prescribing and dispensing practices in health centres of Khartoum state, 2003-04. East Mediterr Health J 2009;15:122-8. Meremikwu M, Okomo U, Nwachukwu C, Oyo-Ita A, Eke-Njoku J, Okebe J, et al. Antimalarial drug prescribing practice in private and public health facilities in South-east Nigeria: A descriptive study. Malar J 2007;6:55. Ogwal-Okeng JW, Obua C, Waako P, Aupont O, Ross-Degnan D. A comparison of prescribing practices between public and private sector physicians in Uganda. East Afr Med J 2004 2(Suppl):S12-6. Chapman S, Durieux P, Walley T. Good prescribing practice. In: Mossialos E, Mrazek M, Walley T, editors. Regulating Pharmaceuticals in Europe: Striving for Efficiency, Equity, and Quality. Milton Keynes, United Kingdom: Open University Press, 2004. World Health Organization. How to Investigate Drug Use in Health Facilities: Selected Drug Use Indicators. EDM Research Series No. 007. Geneva: World Health Organization, 1993. Araoye MO. Sample size determination. In: Margaret OA, editor. Research Methodology with Statistics for Health and Social Workers. Ilorin: Nathadex Publishers, 2004; 115-21. Eze UI, Olowu AO. Prescribing patterns and inappropriate use of medications in elderly outpatients in a tertiary hospital in Nigeria. Trop J Pharm Res 2011;10:19-25. Irute John E, Ojieabu Winifred A, Patani-Okolosi OE, Iwor Chioma P. Prescribing trends of antimalarial drugs in a primary health care facility in delta state. World J Pharm Res 2016;5:1-10. Abdo-Rabbo A. Prescribing rationality and availability of antimalarial drugs in Hajjah, Yemen. East Mediterr Health J 2003;9:607-17. Afriyie D, Tetteh R. A description of the pattern of rational drug use in Ghana police hospital. Int J Pharm Pharmacol 2014;3:143-8. Fattouh R, Abu Hamad B. Impact of using essential drug list: Analysis of drug use indicators in Gaza Strip. East Mediterr Health J 2010;16:886-92. Awad A, Al-Saffar N. Evaluation of drug use practices at primary healthcare centers of Kuwait. Eur J Clin Pharmacol 2010;66:1247-55. El Mahalli AA. WHO/INRUD drug prescribing indicators at primary health care centres in Eastern province, Saudi Arabia. East Mediterr Health J 2012;18:1091-6. Igboeli NU, Ukwe CV, Ekwunife OI. Increasing use of artemisinin-based combination therapy for treatment of malaria infection in Nigerian hospitals. Pharm Pract (Granada) 2010;8:243-9. Igbiks T, Joseph O. Drug prescription pattern in a Nigerian tertiary hospital. Trop J Pharm Res 2012;11:146-52. Bhavesh KL, Hiray RS, Ghongane BB. Drug prescription pattern of outpatients in a tertiary care teaching hospital in Maharashtra. Int J Pharm Bio Sci 2012;3:225-9. Koley M, Saha S, Arya JS, Choubey G, Ghosh S, Purkait R, et al. A study on drug utilization and prescription habits of physicians in a government homeopathic hospital in West Bengal, India. J Integr Med 2013;11:305-13. Alyamani NA, Hopf Y, Williams DJ. Prescription quality in an acute medical ward. Pharmacoepidemiol Drug Saf 2009;18:1158-65. Afriyie DK, Amponsah SK, Antwi R, Nyoagbe SY, Bugyei KA. Prescribing trend of antimalarial drugs at the Ghana Police Hospital. J Infect Dev Ctries 2015;9:409-15. Lenjisa LJ, Fereja HT. A retrospective analysis of prescribing practices through WHO prescribing indicators at four selected hospitals of West Ethiopia. J Bioanal Biomed 2014;6:29-33. Naseeb TA, Nasser MA. Drug prescribing indicators in primary health care centers in Bahrain. Saudi Med J 2005;26:1436-8. Sunil K, Punam S, Madhuri K. Patterns of prescription and drug dispensing. Indian J Pediatr 2005;72:117-21. Maïga MD, Diawara A. Study on the availability and cost of medicines in the private sector in Mali. Med Trop (Mars) 2006;66:565-8.